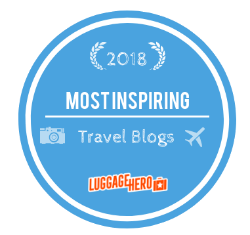 Oman ranks up there as one of our favorite destinations for travel. A beautiful country with an interesting culture, it welcomes visitors with open arms. The residents are friendly, especially to families with children. Children are everywhere, so finding family resorts in Oman isn’t hard. 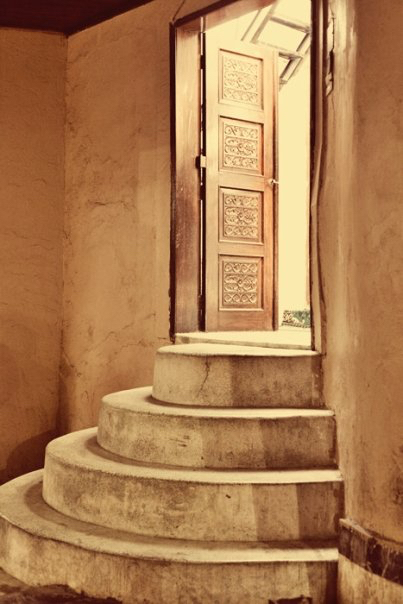 One of the most interesting thing we found about Oman was the people. They’re hard workers and the Omani people work in all sectors – a big change from countries such as Qatar and Saudi Arabia, where expats make up the bulk of the workforce. When we debarked our plane, we noticed an Omani working the bookstore in the airport. We caught a taxi to our hotel and he was Omani. The lady who checked us in was Omani. It was very surprising to see after living in Qatar. A big reason we loved Oman was the resort we visited. 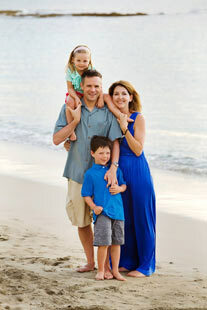 The Grand Hyatt Muscat is one of the best resorts for families in Oman. A large hotel, with a huge pool and an enormous beach in front, the whole resort is top-notch. Arriving at the Grand Hyatt is an amazing experience. The hotel is in the diplomatic district of Muscat, with beautiful Arabian style architecture and a large, impressive entrance and friendly bellman. The inner lobby area is gorgeous, with marble floors, an extensive lobby bar/tea room and huge windows looking out onto the pool and outdoor gardens. The Grand Hyatt Muscat has over 200 rooms and suites, six restaurants and bars, a fitness center and tennis courts. The staff is very family friendly and the pool is amazing for families. The pool is heated in the winter and chilled in the summer (yes, it does get so hot in Oman that chilled pools are necessary). The best part? The lazy river. Our kids loved the lazy river, which makes its way around the pool. The beach is also perfect for sand castles and an afternoon stroll. Located a bit outside Muscat is the Shangri-la Resort Muscat. 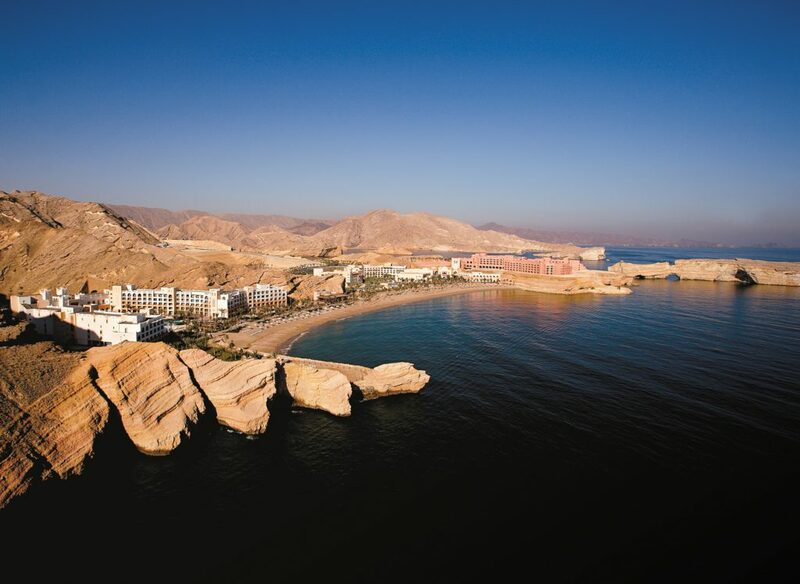 Situated in a secluded bay, Shangri-la is truly a family oasis on the Sea of Oman. Consisting of three hotels in one, the property is huge and has something for everyone. Beautiful and unique, with traditional Arabian architecture, the resort is not only luxurious, but really caters to families. There’s a great kids club, called the Cool Zone, for children ages 4 to 8; an Adventure Zone with a climbing wall; PS3s; soft play areas; a large children’s pool and a lazy river and a splashpad for really little ones. In addition, there’s a game room for all and a mini golf area. In case people are still bored after all that, there are camel rides from 3:30 to 6:30 every afternoon. Each hotel within the property has something a little different to cater to everyone. Al Waha hotel is considered Muscat’s first “family hotel”, has numerous family guestrooms and suites and several pools. Al Bandar is a true five-star resort with plenty of restaurants, suites and a ballroom. Al Husn is the most exclusive of the three hotels and children under 16 are not allowed. Not surprisingly, Al Husn has the most luxurious accommodations. 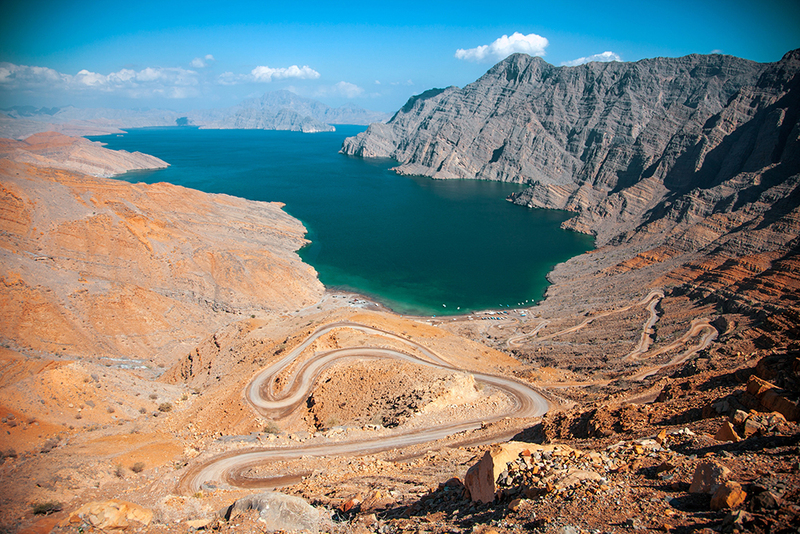 For those families looking to be totally outside of Muscat, Six Senses Zighy Bay is the place. Guests fly to Dubai ariport for this resort, not Muscat. Traditionally, Six Senses resorts are known as luxury resorts catering mostly to adults, Zighy Bay is a great family friendly resort in Oman. The children’s club, for kids ages 4 to 10, has water sports, sandcastle building and treasure hunts. The teens club has adventure hikes, swimming and archery. There is also an outdoor movie theatre, which serves popcorn and 40 different flavors of ice cream. The rooms at Zighy Bay are very spacious and can accommodate a family of 4 or more very easily. Many come with their own private pool, a private garden and an outdoor dining space. Perfect for a family who want to let kids run around. The advantage to being so outside of Muscat? Nature! The resort is located on a northern penninsula in Oman, nowhere near big cities and, as such, offers tons of outdoor activities for families and beautiful mountainous scenery. 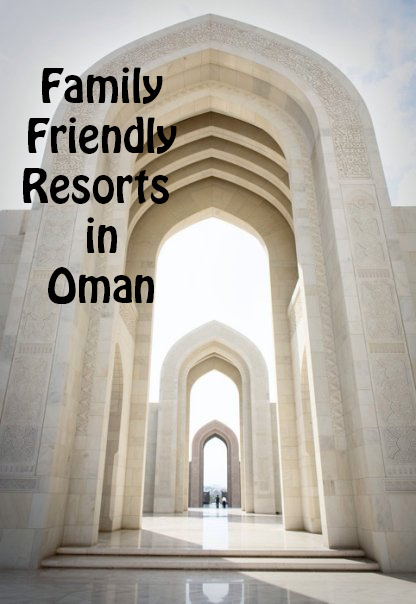 All in all, the whole country of Oman is family friendly, just like the majority of the middle east. Family is important in the Gulf countries. One would be hard pressed to find a non-family resort, but these three definitely qualify as best family resorts in Oman. The Gulf countries have a very interesting culture, one that I am constantly extolling the virtues of. Many westerners write off that area of the world but a visit is well worth the time and money. In truth, I would pick Oman over any Florida resort for a family vacation. I can help you plan an Oman vacation! Contact me here. Very helpful post! Thank you for these simple reviews. We live in Abu Dhabi; will be taking the kids to Oman soon, I think! I’m glad I could help! How do you like AD? We always say that if we ever move back to the Gulf, it will be Abu Dhabi! Really helpful. We are living in Asia and thinking about traveling to Oman with our teens and preteens next winter. What time of year did you visit?